This thoughtful demonstration navigates the evolution of English dressage, from its humble beginnings in the medieval period to its modern style and usage. Learn more of how techniques and manoeuvres performed by cavalry during battle in the Middle Ages have heavily influenced the modern-day sport we see today; as well as learning more of the preparation required to train a horse to this standard. 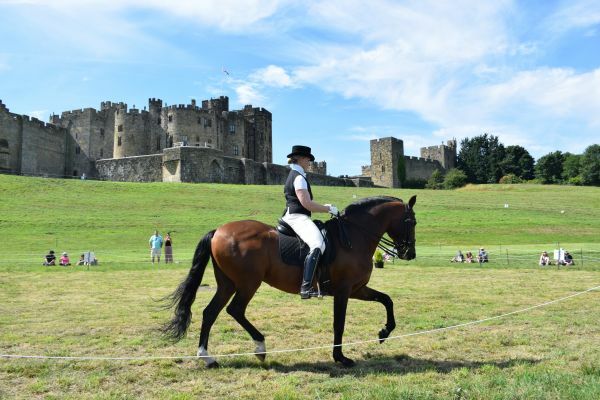 These terrific dressage displays are free with admission to Alnwick Castle and will be held between the Alnwick Jousting Tournament! Please check the ‘What’s On’ board upon arrival for show timings and locations, as these can vary throughout the season.